performing live in the historic Observation Bar. Come a little earlier for Happy Hour from 5 p.m. to 7 p.m. The Queen Mary’s 1936 Art Deco Observation Bar offers an intimate venue for music-lovers, entertainment-seekers and history buffs alike to enjoy some of SoCal’s top artists. “Using such a unique space as the Queen Mary for local musicians to attract new fans is really quite exciting. We can’t wait to connect these talented new artists with passionate music fans in a venue that has hosted so many celebrated performers,” said Steve Sheldon, Director of Events and Entertainment at The Queen Mary. 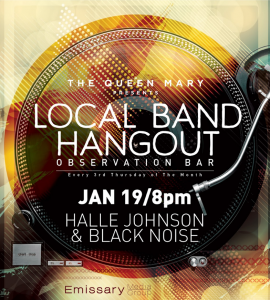 The January 19 concert welcomes renowned indie songwriter Halle Johnson and Long Beach’s own singer/songwriter duo Black Noise. Concerts will continue the third Thursday of each month at 8 p.m. with future performances to be announced soon.